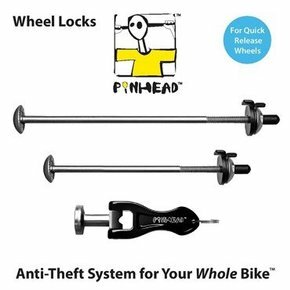 Started in 1997, Pinhead is now the industry leader in bicycle component locks. Pinhead locks are used by cyclists, rental fleets, and bike share programs in more than 20 countries to protect bicycles and major bicycle parts. We service and support our products by providing free replacement of any defective item for the lifetime of the purchaser, free on-line key code registration, live telephone and internet technical support, and daily-shipment key and part replacement services depots in Canada and Germany. Locks for all major bicycle components including frame locks, quick-release and solid axle wheel locks, seat post and saddle locks, and headset locks. All components are precision molded and forged from corrosion-resistant CrMo steel and aircraft aluminum alloys. Once installed, the locks remain permanently on the bicycle, even when you ride. When you need to remove your wheels for servicing, or adjust your saddle height, your Pinhead key lets you do this quickly and easily. Each lock provides improved safety and security over quick-release and other fastening methods. All locks use a special coded key that comes with each lockset. Each key is different and comes with an engraved nine-digit code so it can be replaced if lost, and matching locksets can be ordered.